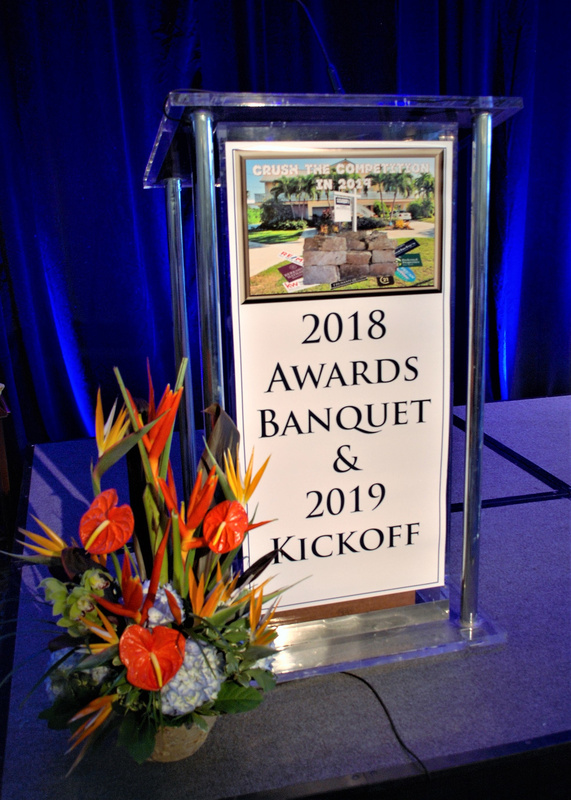 Florida Keys – March 25, 2019 - Coldwell Banker Schmitt Real Estate Company (CBSREC) hosted its annual Awards Banquet on March 2 recognizing achievements by agents, staff, and business partners at Hawk’s Cay Resort on Duck Key. Attending were 199 agents, staff and guests from the company’s five offices in Key Largo, Islamorada, Marathon, Big Pine Key, and Key West plus guests. Among the special guests this year were Michele Brossard, and Tom Wright of Thomas D. Wright Law Office; Carolyn Frey of Mortgage Lending Solutions, John Hally, Tropical Technologies, and several representatives from Coldwell Banker including Lynn Conrad, Brand Ambassador, Coldwell banker Real Estate LLC, and Russell Stinnett, Regional Vice President-Franchise & Brand Development. Lisa Ferringo from the Lower Keys office was awarded Overall Company Top Producer and Top Listing Agent as well as the Top Lower Keys Office Agent for the company in 2018. The Alina Davis Team was awarded Top Islamorada Office Agents. Vic Musmanno received the Top Key West Office Agent. Sally Stribling was awarded Top Key Largo Office Agent and Sam Williams was Top Middle Keys Office Agent. The award for Top Short-Term Rental Agent went to Barbara McKee of the Middle Keys office, and the award for Top Long-Term Rental Agent went to Tom McLaughlin of the Key West office. CBSREC has three Rising Stars for 2018, April Struhs (Key Largo), Lisa Habecker and Anneliese Dietrick (both of the Lower Keys office). The Commitment Award was given to Nancy Lillie (Chief Financial Officer) for her dedication and above-and-beyond effort over the past year. The President’s Award was bestowed on Ed Anderson (General Manager) by president/broker, Brian Schmitt, to acknowledge his extraordinary contributions to the company and its agents during his years of service with the company. The Coldwell Banker Schmitt Charitable Foundation (CBSCF) Founders’ Award acknowledges the Coldwell Banker Schmitt agent or employee whose work best exemplified the Foundation’s mission and it was conferred on Nira Tocco (Lower Keys Office), for her dedication and work on its behalf. Nira has served as the Chairman of the Board of the CBSCF for several years. She was the key organizer for Bingo at Boondocks since 2011. After Hurricane Irma, she worked tirelessly with other local Keys organizations to help individuals and families in Monroe County recover after devastating losses. Coldwell Banker Schmitt is the oldest and largest real estate company in the Florida Keys with offices conveniently located in each of the five major Keys market areas. It has been the Keys-wide leader in listings and sales since 2005 and boasts a 98+ percent rating of customer satisfaction. Since 1955 – The Most Trusted name in Florida Keys Real Estate.” Our longevity and focus on Trust is unique and one of our biggest differentiators. I want to make sure no one loses sight of that fact. For additional information, visit Coldwell Banker Schmitt’s website at RealEstateFloridaKeys.com, or email info@cbschmitt.com, or call any of its five locations in the Florida Keys. To learn more about professional opportunities and why Coldwell Banker Schmitt agents and staff average more than nine years of service with the company, visit the Careers center.